3.2. OpenIG or Policy Agent? Guide to installing OpenAM web policy agents. OpenAM provides open source Authentication, Authorization, Entitlement and Federation software. This guide shows you how to install OpenAM web server policy agents, as well as how to integrate with other access management software. Read the OpenAM Web Policy Agent Release Notes before you get started. This guide is written for anyone installing OpenAM policy agents to interface with supported web servers application containers. This guide covers procedures that you theoretically perform only once per version. This guide aims to provide you with at least some idea of what happens behind the scenes when you perform the steps. ForgeRock provides support services, professional services, classes through ForgeRock University, and partner services to assist you in setting up and maintaining your deployments. For a general overview of these services, see https://www.forgerock.com. OpenAM web policy agents provide light touch integration for web applications running on supported web servers. This chapter covers what web policy agents do and how they work. A policy agent enforces policy for OpenAM and protects all resources on the web server. The policy agent intercepts requests from users trying to access a protected web resource and denies access until the user has authorization from OpenAM to access the resource. A single policy agent can work with multiple applications. You therefore install only one policy agent per web server. Installing more than one policy agent in a web server is not supported. The web policy agent provides fast installation and light touch integration to protect the resources on the supported web server. The web agent consists of a web server plugin matching the API requirements of the particular web server and a native module that interfaces with OpenAM for its services. Imagine that a user attempts to access a protected resource before having authenticated by pointing the user's browser to a web page. Assume that you have configured OpenAM to protect the web page. Then, the web policy agent intercepting the user's browser's request finds no session token in the request, and so redirects the user's browser to the OpenAM login page for authentication. After the user has successfully authenticated, OpenAM sets a session token in a browser cookie, and redirects the browser back to the page the user tried to access initially. When the user's browser reiterates the request, the policy agent again checks that the request has a session token, finds a session token this time, and validates the session token with OpenAM. Given the valid session token, the policy agent gets a policy decision from OpenAM concerning whether the user can access the page. If OpenAM's Policy Service determines that the user is allowed to access the page, OpenAM responds to the policy agent that access should be granted. The web policy agent then permits the web page to be returned to the user's browser. The following diagram shows how the pieces fit together when a web client accesses a web page protected by a policy agent. This diagram is simplified to show only the essential principals rather than to describe every possible case. The web client requests access to a protected resource. The web server runs the request through the policy agent that protects the resource according to OpenAM policy. The policy agent acts to enforce policy, whereas the policy configuration and decisions are handled by OpenAM. The policy agent communicates with OpenAM to get the policy decision to enforce. For a resource to which OpenAM approves access, the policy agent allows access. The web server returns the requested access to the web client. The Web policy agent provides a number of additional features useful for your deployment, some of which are described below. Web policy agent instances can be configured to operate with multiple websites in IIS, and with multiple virtual hosts in Apache. Each configuration instance is independent and has its own configuration file, debug logs, and audit logs. Each instance can connect to a different OpenAM realm, or even different OpenAM servers. For more information, see Section 4.3, "Installing Apache Web Policy Agents into a Virtual Host" and Section 5.2, "Installing IIS Web Policy Agents". The agent intercepts all inbound client requests to access a protected resource and processes the request based on a global configuration property, com.sun.identity.agents.config.sso.only. The configuration setting determines the mode of operation that should be carried out on the intercepted inbound request. When com.sun.identity.agents.config.sso.only is true, the web policy agent only manages user authentication. The filter invokes the OpenAM Authentication service to verify the identity of the user. If the user's identity is verified, the user is issued a session token through OpenAM's Session service. When com.sun.identity.agents.config.sso.only is false, which is the default, the web policy agents will also manage user authorization, by using the policy engine in OpenAM. For more information, see Section 3.6.3, "Configuring Web Policy Agent SSO Properties". The policy agent supports properties to bypass authentication and grant immediate access to resources not requiring protection, such as images, stylesheets, or static HTML pages. You can configure a Not-Enforced URL List using the com.sun.identity.agents.config.notenforced.url property that grants the user access to resources whose URLs match those in the list. For more information on wildcard usage, see Wildcard Usage. The policy agent supports a Not-Enforced Client IP List, which specifies the client IP addresses that can be excluded from authentication and authorization. This property is useful to allow administrators access to the web site from a certain IP address or allow a search engine access to the web resources. For finer control, you can configure a not-enforced policy that applies to requests to specified URLs, which also come from a list of specified IP addresses. See Not Enforced URL from IP Processing Properties (Not yet in OpenAM console). For more information on not-enforced lists, see Section 3.6.2, "Configuring Web Policy Agent Application Properties". Web policy agents provide the capability to fetch and inject user information into HTTP headers, request objects, and cookies and pass them on to the protected client applications. The client applications can then personalize content using these attributes in their web pages or responses. Specifically, you can configure the type of attributes to be fetched and the associated mappings for the attributes names used on OpenAM to those values used in the containers. The web policy agent securely fetches the user and session data from the authenticated user as well as policy response attributes. For example, you can have a web page that addresses the user by name retrieved from the user profile, for example "Welcome Your Name!" OpenAM populates part of the request (header, form data) with the CN from the user profile, and the web site consumes and displays it. For more details, see Profile Attributes Processing Properties. The web policy agent requires that clients accessing protected resources use valid URLs with fully qualified domain names (FQDNs). If invalid URLs are referenced, policy evaluation can fail as the FQDN will not match the requested URL, leading to blocked access to the resource. Misconfigured URLs can also result in incorrect policy evaluation for subsequent access requests. There are cases where clients may specify resource URLs that differ from the FQDNs stored in OpenAM policies, for example, in load balanced and virtual host environments. To handle these cases, the web policy agent supports FQDN Checking properties: FQDN Default and FQDN Virtual Host Map properties. The FQDN Default property specifies the default URL with valid hostname. The property ensures that the policy agent can redirect to a URL with a valid hostname should it discover an invalid URL in the client request. The FQDN Virtual Host Map property stores map keys and their corresponding values, allowing invalid URLs, load balanced URLs, and virtual host URLs to be correctly mapped to valid URLs. Each entry in the Map has precedence over the FQDN Default setting, so that if no valid URLs exist in the FQDN Virtual Host Map property, the agent redirects to the value specified in the FQDN Default property. If you want the agent to redirect to a URL other than the one specified in the FQDN Default property, then it is good practice to include any anticipated invalid URLs in the FQDN Virtual Host Map property and map it to a valid URL. For more details, see Fully Qualified Domain Name Checking Properties. OpenAM provides cookie reset properties that the agent carries out prior to redirecting the client to a login page for authentication. Cookie reset is typically used when multiple parallel authentication mechanisms are in play with the policy agent and another authentication system. The policy agent can reset the cookies set by the other mechanism before redirecting the client to a login page. The cookie reset properties include a name list specifying all of the cookies that will reset, a domain map specifying the domains set for each cookie, and a path map specifying the path from which the cookie will be reset. If you have enabled attribute fetching using cookies to retrieve user data, it is good practice to use cookie reset, which will reset once you want to access an enforced URL without a valid session. For more details, see Cookie Reset Properties. Cross domain single sign-on (CDSSO) allows the web policy agent to transfer a validated stateful session ID between an OpenAM domain and an application domain using a proprietary OpenAM mechanism. Normally, single sign-on cannot be implemented across domains as the session cookie from one domain (for example, website.com) is not accessible from another domain (for example, website.net). OpenAM's CDSSO solves this cross-domain problem and is best implemented in environments where all the domains are managed by the same organization, and where the OpenAM server is configured to use stateful sessions. OpenAM does not support CDSSO for deployments with stateless sessions. The web policy agent works with an OpenAM component called a CDCServlet that generates a self-submitting form containing the valid session token from one domain. The form gets auto-submitted to the policy agent endpoint via a POST operation. The policy agent processes the request and extracts the session ID, which is again validated by OpenAM. If validation is successful, the policy agent sets the cookie in alternate domain. The client can then access a resource in that domain. For more details, see Configuring Cross Domain Single Sign-On. 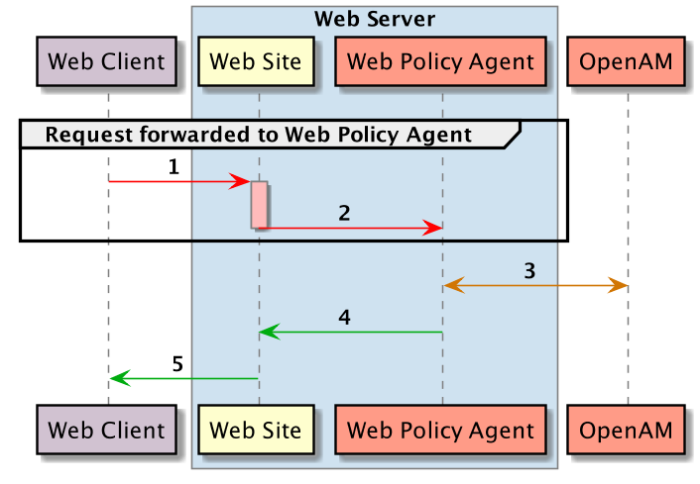 The web policy agent provides a number of advanced properties for load balancer deployments fronting multiple policy agents. Properties are available to get the client IP and host name from the load balancer. If the policy agent is running behind a load balancer, you can configure the policy agent to set a sticky cookie or a query parameter in the URL to ensure subsequent requests are routed to the same instance to preserve session data. These mechanisms ensure that unauthenticated POST data can be preserved. Policy agents store POST data in the cache and do not share the data among the agents behind the load balancer. For more details, see Section 3.7, "Configuring Web Policy Agents Behind Load Balancers". Web policy agents support more than one agent instance running on the same host by properly initializing the multi-process locks/semaphores during the bootstrap process. You install policy agents in web servers and web application containers to enforce access policies OpenAM applies to protected web sites and web applications. Policy agents depend on OpenAM for all authentication and authorization decisions. Their primary responsibility consists in enforcing what OpenAM decides in a way that is unobtrusive to the user. In organizations with many servers, you might well install many policy agents. By default, policy agent configuration settings are stored centrally in the OpenAM configuration store. Storing the policy agent configuration centrally allows you to configure your policy agents by using the OpenAM console, the ssoadm command line tool, or the REST API for easier management. Any property change made in OpenAM is immediately communicated to the agent by using a notification. Many policy agent properties are hot-swap enabled, allowing the change to take effect immediately without restarting the policy agent. You configure policy agents in realms. To access the centralized web policy agent configuration, select Realms > Realm Name > Agents > Web > Agent Name in the OpenAM console. For more information on creating centrally-stored agent profiles, see Section 3.4, "Creating Agent Profiles". The policy agent installer can create a flat file with the agent configuration. The file is named agent.conf and is stored at the path /web_agents/agent_versioninstances/Agent_nnn/config. If you choose to use a locally-stored agent configuration, you make all configuration changes by modifying property values in the agent.conf file. You cannot make changes using the OpenAM console, command-line interface, or REST API. The web policy agent installer populates properties required to connect to an OpenAM instance. Additional properties are needed when settings are stored locally. OpenAM supports both OpenIG and also a variety of policy agents. OpenIG and the policy agents can both enforce policy, redirecting users to authenticate when necessary, and controlling access to protected resources. OpenIG runs as a self-contained reverse proxy located between the users and the protected applications. Policy agents are installed into the servers where applications run, intercepting requests in that context. Use OpenIG to protect access to applications not suited for a policy agent. Not all web servers and Java EE applications have policy agents. Not all operating systems work with policy agents. Policy agents have the advantage of sitting within your existing server infrastructure. Once you have agents installed into the servers with web applications or sites to protect, then you can manage their configurations centrally from OpenAM. For organizations with both servers on which you can install policy agents and also applications that you must protect without touching the server, you can use policy agents on the former and OpenIG for the latter. When you open the OpenAM console to configure agents for the top-level realm, you can choose from a number of different types of agents. Each agent type requires an agent profile in OpenAM. The agent profile contains essential configuration for agent operation, such as a password to authenticate the agent, and the URL the agent resides at. For agents that support it, the agent profile can store all agent configuration centrally, rather than locally on the agent server. You install web agents in web servers to protect web sites. You install J2EE agents in web application containers to protect web applications. WSP agents are for use with Web Services Security. WSC agents are for use with Web Services Security. The Security Token Service client agent is for securing requests to the Security Token Service. Version 2.2 web and Java EE policy agents hold their configuration locally, connecting to OpenAM with a username/password combination. This agent type is provided for backwards compatibility. OAuth 2.0 clients are registered using this type of policy agent profile. The agent authenticator can read agent profiles by connecting to OpenAM with a user name, password combination, but unlike the agent profile administrator, cannot change agent configuration. This section concerns creating agent profiles, and creating groups that let agents inherit settings when you have many agents with nearly the same profile settings. Login to OpenAM Console as an administrative user. On the Realms menu of the OpenAM console, select the realm in which the agent profile is to be managed. Click the Agents link, click the tab page for the kind of agent profile you want to create, and then click the New button in the Agent table. In the Name field, enter a name for the agent profile. In the Password and Re-Enter Password fields, enter a password for the new agent profile. Click Local or Centralized (Default) to determine where the agent properties are stored. If you select Local, the properties are stored on the server on which the agent is running. If you select Centralized, the properties are stored on the OpenAM server. In the Server URL field, enter the URL to OpenAM. For example, http://openam.example.com:8080/openam. In the Agent URL field, enter the primary URL of the web or application server protected by the policy agent. Note for web agents, an example URL would look like: http://www.example.com:80. For Java EE policy agents, an example URL must include the agentapp context: http://www.example.com:8080/agentapp. Click Create. After creating the agent profile, you can click the link to the new profile to adjust and export the configuration. On the Realms menu of the OpenAM console, Select the realm in which you manage agents. Click the Agents link, click the tab page for the kind of agent group you want to create, and then in the Group table, click New. After creating the group profile, you can click the link to the new group profile to fine-tune or export the configuration. Inherit group settings by selecting your agent profile, and then selecting the group name in the Group drop-down list near the top of the profile page. You can then adjust inheritance by clicking Inheritance Settings on the agent profile page. You can create a policy agent profile in OpenAM using the ssoadm command-line tool. You do so by specifying the agent properties either as a list of attributes, or by using an agent properties file as shown below. Export an existing policy agent configuration before you start to see what properties you want to set when creating the agent profile. Make sure the ssoadm command is installed. See "To Set Up Administration Tools" in the OpenAM Installation Guide. Determine the list of properties to set in the agent profile. At this point you can view the profile in OpenAM Console under Realms > Realm Name > Agents to make sure the configuration is what you expect. If you want to create policy agent profiles when installing policy agents, then you need the credentials of an OpenAM user who can read and write agent profiles. You can use the OpenAM administrator account when creating policy agent profiles. If you delegate policy agent installation, then you might not want to share OpenAM administrator credentials with everyone who installs policy agents. In OpenAM console, browse to Realms > Realm Name > Subjects. Under Group click New... and create a group for agent administrators. Switch to the Privileges tab for the realm, and click the name of the group you created. Select Read and write access to all configured agents, and then Save your work. Return to the Subjects tab, and under User create as many agent administrator users as needed. For each agent administrator user, edit the user profile. Under the Group tab of the user profile, add the user to agent profile administrator group, and then Save your work. Provide each system administrator who installs policy agents with their agent administrator credentials. When installing the policy agent with the --custom-install option, the system administrator can choose the option to create the profile during installation, and then provide the agent administrator user name and the path to a read-only file containing the agent administrator password. For silent installs, you can add the --acceptLicense option to auto-accept the software license agreement. Some properties do not yet appear in the OpenAM Console, so they need to be configured as custom properties, see Section 3.6.7, "Configuring Web Policy Agent Custom Properties", or locally in the agent properties configuration file, agent.conf. To show the agent properties in configuration file format that correspond to what you see in the console, click Export Configuration after editing agent properties. This corresponds to the local Java properties configuration file that is set up when you install an agent, for example in agent_1/config/agent.conf. After changing properties specified as "Hot swap: no", you must restart the agent's container for the changes to take effect. This section covers global web agent properties. After creating the agent profile, you access these properties in the OpenAM console under Realms > Realm Name > Agents > Web > Agent Name > Global. For assigning the agent to a previously configured web agent group in order to inherit selected properties from the group. Agent password used when creating the password file and when installing the agent. Status of the agent configuration. Whether the agent's configuration is managed centrally through OpenAM (centralized) or locally in the policy agent configuration file (local). If you change this to a local configuration, you can no longer manage the policy agent configuration through OpenAM console. Enable agent to receive notification messages from OpenAM server for configuration changes. If enabled, the agent receives policy updates from the OpenAM notification mechanism to maintain its internal cache. If disabled, the agent must poll OpenAM for changes. URL used by agent to register notification listeners. The default value is agent-root-URL/amagent. Interval in minutes to fetch agent configuration from OpenAM. Used if notifications are disabled. Default: 60. Interval in minutes to cleanup old agent configuration entries unless they are referenced by current requests. Default: 30. The agent root URL for CDSSO. The valid value is in the format protocol://hostname:port/ where protocol represents the protocol used, such as http or https, hostname represents the host name of the system where the agent resides, and port represents the port number on which the agent is installed. The slash following the port number is required. If your agent system also has virtual host names, add URLs with the virtual host names to this list as well. OpenAM checks that the goto URLs match one of the agent root URLs for CDSSO. When enabled, the agent enforces authentication, so that upon verification of the user's identity, the user receives a session token. When true , the web policy agent only manages user authentication. The filter invokes the OpenAM Authentication service to verify the identity of the user. If the user's identity is verified, the user is issued a session token through OpenAM's Session service. When false, which is the default, the web policy agents will also manage user authorization, by using the policy engine in OpenAM. The URL of the customized access denied page. If no value is specified (default), then the agent returns an HTTP status of 403 (Forbidden). Default is Error. Increase to Message or even All for fine-grained detail. When enabled, rotate the debug file when specified file size is reached. Debug file size in bytes beyond which the log file is rotated. The minimum is 5242880 bytes (5 MB), and lower values are reset to 5 MB. OpenAM console sets a default of 10000000 bytes (approximately 10 MB). If com.sun.identity.agents.config.debug.file.rotate is enabled, setting com.sun.identity.agents.config.debug.file.size to -1 in the agent.conf file will rotate debug log files once every 24 hours rather than at a specified size limit. Name of file stored locally on the agent that contains agent debug messages. Types of messages to log based on user URL access attempts. Valid values for the configuration file property include LOG_NONE, LOG_ALLOW, LOG_DENY, and LOG_BOTH. Specifies where audit messages are logged. By default, audit messages are logged remotely. Valid values for the configuration file property include REMOTE, LOCAL, and ALL. Name of file stored on OpenAM server that contains agent audit messages if log location is remote or all. Periodic interval in minutes in which audit log messages are sent to the remote log file. When enabled, audit log files are rotated when reaching the specified size. Beyond this size limit in bytes, the agent rotates the local audit log file if rotation is enabled. The minimum is 5242880 bytes (5 MB), and lower values are reset to 5 MB. OpenAM console sets a default of 52428800 bytes (50 MB). Name of file stored locally on the agent that contains agent audit messages if log location is LOCAL or ALL. Enables checking of FQDN default value and FQDN map values. FQDN that the users should use in order to access resources. Without this value, the web server can fail to start, thus you set the property on agent installation, and only change it when absolutely necessary. This property ensures that when users access protected resources on the web server without specifying the FQDN, the agent can redirect the users to URLs containing the correct FQDN. Enables virtual hosts, partial hostname, and IP address to access protected resources. Maps invalid or virtual name keys to valid FQDN values so the agent can properly redirect users and the agents receive cookies belonging to the domain. To map myserver to myserver.mydomain.example, enter myserver in the Map Key field, and enter myserver.mydomain.example in the Corresponding Map Value field. This corresponds to com.sun.identity.agents.config.fqdn.mapping[myserver]= myserver.mydomain.example. Invalid FQDN values can cause the web server to become unusable or render resources inaccessible. This section covers application web agent properties. After creating the agent profile, you access these properties in the OpenAM console under Realms > Realm Name > Agents > Web > Agent Name > Application. When enabled, the path info and query are stripped from the request URL before being compared with the URLs of the not enforced list for those URLs containing a wildcard character. This prevents a user from accessing http://host/index.html by requesting http://host/index.html/hack.gif when the not enforced list includes http://host/*.gif. For a more generally applicable setting, see Ignore Path Info Properties. Enable use of Perl-compatible regular expressions in Not Enforced URL settings by using the following property under Advanced > Custom Properties in the agent profile. List of URLs for which no authentication is required. You can use wildcards to define a pattern for a URL. The * wildcard matches all characters except question mark (? ), cannot be escaped, and spans multiple levels in a URL. Multiple forward slashes do not match a single forward slash, so * matches mult/iple/dirs, yet mult/*/dirs does not match mult/dirs. The -*- wildcard matches all characters except forward slash (/) or question mark (? ), and cannot be escaped. As it does not match /, -*- does not span multiple levels in a URL. OpenAM does not let you mix * and -*- in the same URL. Examples include http://www.example.com/logout.html, http://www.example.com/images/*, http://www.example.com/css/-*-, and http://www.example.com/*.jsp?locale=*. Trailing forward slashes are not recognized as part of a resource name. Therefore http://www.example.com/images// and http://www.example.com/images are equivalent. The following example shows settings where no authentication is required for URLs whose path ends /PublicServletA or /PublicServletB (with or without query string parameters), and no authentication is required to access .png, .jpg, .gif, .js, or .css files under URLs that do not contain /protectedA/ or /protectedB/. When enabled, the agent fetches profile, response, and session attributes that are mapped by doing policy evaluation, and forwards these attributes to not enforced URLs. No authentication and authorization are required for the requests coming from these client IP addresses. The following example shows an IPv6 address with a corresponding network mask. Currently the policy agent stops evaluating properties after reaching an invalid netmask in the list. The following example shows a range of IPv6 addresses. The example is displayed over two lines for formatting purposes. Loopback addresses are not considered valid IPs on the Not Enforced IP list. If specified, the policy agent ignores the loopback address. When enabled, validate that the subsequent browser requests come from the same IP address that the SSO token is initially issued against. No authentication and authorization are required for requests coming from specified client IP addresses that are requesting specified resource URLs. Specify a list of IP addresses separated by spaces, the pipe (|) character, and a list of URLs separated by spaces. To specify requests coming from addresses in the range 192.168.1.1 to 192.168.1.255, use the following setting. To specify requests coming from addresses in the range 192.168.1.1 to 192.168.4.3 inclusive, use the following setting. The following example shows a range of IPv6 addresses. The URL list can be specified by using wildcards (*) or regular expressions. To use regular expression matches in the URL list, set org.forgerock.agents.config.notenforced.ext.regex.enable=true. Do not mix using wildcards and regular expressions. Multiple values should be separated by space characters. The following example will not require authentication or authorization for any requests coming from the specified IP addresses, when also requesting access to a /reports URL, or certain files under the /images URL. The example is displayed over three lines for formatting purposes. Enable use of Perl-compatible regular expressions in Not Enforced URL from IP settings. When set to HTTP_COOKIE or HTTP_HEADER, profile attributes are introduced into the cookie or the headers, respectively. Maps the profile attributes to HTTP headers for the currently authenticated user. Map keys are LDAP attribute names, and map values are HTTP header names. To populate the value of profile attribute CN under CUSTOM-Common-Name, enter CN in the Map Key field, and enter CUSTOM-Common-Name in the Corresponding Map Value field. This corresponds to com.sun.identity.agents.config.profile.attribute.mapping[cn]=CUSTOM-Common-Name. In most cases, in a destination application where an HTTP header name shows up as a request header, it is prefixed by HTTP_, lower case letters become upper case, and hyphens (-) become underscores (_). For example, common-name becomes HTTP_COMMON_NAME. When set to HTTP_COOKIE or HTTP_HEADER, response attributes are introduced into the cookie or the headers, respectively. Maps the policy response attributes to HTTP headers for the currently authenticated user. The response attribute is the attribute in the policy response to be fetched. To populate the value of response attribute uid under CUSTOM-User-Name: enter uid in the Map Key field, and enter CUSTOM-User-Name in the Corresponding Map Value field. This corresponds to com.sun.identity.agents.config.response.attribute.mapping[uid]=Custom-User-Name. In most cases, in a destination application where an HTTP header name shows up as a request header, it is prefixed by HTTP_, lower case letters become upper case, and hyphens (-) become underscores (_). For example, response-attr-one becomes HTTP_RESPONSE_ATTR_ONE. When set to HTTP_COOKIE or HTTP_HEADER, session attributes are introduced into the cookie or the headers, respectively. Maps session attributes to HTTP headers for the currently authenticated user. The session attribute is the attribute in the session to be fetched. To populate the value of session attribute UserToken under CUSTOM-userid: enter UserToken in the Map Key field, and enter CUSTOM-userid in the Corresponding Map Value field. This corresponds to com.sun.identity.agents.config.session.attribute.mapping[UserToken] =CUSTOM-userid. In most cases, in a destination application where an HTTP header name shows up as a request header, it is prefixed by HTTP_, lower case letters become upper case, and hyphens (-) become underscores (_). For example, success-url becomes HTTP_SUCCESS_URL. Specifies separator for multiple values. Applies to all types of attributes, such as profile, session, and response attributes. Default: |. This section covers SSO web agent properties. After creating the agent profile, you access these properties in the OpenAM console under Realms > Realm Name > Agents > Web > Agent Name > SSO. Name of the SSO Token cookie used between the OpenAM server and the agent. Default: iPlanetDirectoryPro. When enabled, the agent marks cookies secure, sending them only if the communication channel is secure. As of version 3.0.5, web policy agents with this property set to true mark cookies as HTTPOnly, to prevent scripts and third-party programs from accessing the cookies. Enables Cross Domain Single Sign On (CDSSO) for OpenAM deployments that use stateful sessions. CDSSO is not supported for OpenAM deployments that use stateless sessions. List of URLs of the available CDSSO controllers that the agent can use for CDSSO processing. For example, http://openam.example.com:8080/openam/cdcservlet. List of domains, such as .example.com, in which cookies have to be set in CDSSO. If this property is left blank, then the fully qualified domain name of the cookie for the agent server is used to set the cookie domain, meaning that a host cookie rather than a domain cookie is set. To set the list to .example.com, and .example.net using the configuration file property, include the following. When enabled, agent resets cookies in the response before redirecting to authentication. List of cookies in the format name[=value][;Domain=value]. Concrete examples include the following with two list items configured. LtpaToken, corresponding to com.sun.identity.agents.config.cookie.reset=LtpaToken. The default domain is taken from FQDN Default. This section covers OpenAM services web agent properties. After creating the agent profile, you access these properties in the OpenAM console under Realms > Realm Name > Agents > Web > Agent Name > OpenAM Services. OpenAM login page URL, such as http://openam.example.com:8080/openam/UI/Login, to which the agent redirects incoming users without sufficient credentials so that they can authenticate. To conditionally redirect users based on the incoming request URL, set this property. This takes the incoming request domain to match, a vertical bar ( | ), and then a comma-separated list of URLs to which to redirect incoming users. If the domain before the vertical bar matches an incoming request URL, then the policy agent uses the list of URLs to determine how to redirect the user-agent. If the global property FQDN Check (com.sun.identity.agents.config.fqdn.check.enable) is enabled for the policy agent, then the policy agent iterates through the list until it finds an appropriate redirect URL that matches the FQDN check. Otherwise, the policy agent redirects the user-agent to the first URL in the list. If CDSSO is enabled for the policy agent, then this property takes CDSSO Servlet URLs for its values (com.sun.identity.agents.config.cdsso.cdcservlet.url), rather than OpenAM login URLs. Timeout period in seconds for an agent connection with OpenAM auth server. Interval in minutes, agent polls to check the primary server is up and running. Default: 5. OpenAM logout page URL, such as http://openam.example.com:8080/openam/UI/Logout. Logout URL redirect is enabled by default. When this is disabled, instead of redirecting the user-agent, the policy agent performs session logout in the background and then continues processing access to the current URL. Disable this using Advanced > Custom Properties in the agent profile. List of application logout URLs, such as http://www.example.com/logout.html. The user is logged out of the OpenAM session when these URLs are accessed. When using this property, specify a value for the Logout Redirect URL property. Perl-compatible regular expression that matches logout URLs. Set this using Advanced > Custom Properties in the agent profile. When you use this property, the agent ignores the settings for Logout URL List. Cookies to be reset upon logout in the same format as the cookie reset list. User gets redirected to this URL after logout. Specify this property alongside a Logout URL List. Polling interval in minutes during which an entry remains valid after being added to the agent's cache. Polling interval in minutes during which an SSO entry remains valid after being added to the agent's cache. Agent sets this value for User Id passed in the session from OpenAM to the REMOTE_USER server variable. Default: UserToken. User ID can be fetched from either SESSION or LDAP attributes. Default: SESSION. When enabled, the agent caches the policy decision of the resource and all resources from the root of the resource down. For example, if the resource is http://host/a/b/c, then the root of the resource is http://host/. This setting can be useful when a client is expect to access multiple resources on the same path. Yet, caching can be expensive if very many policies are defined for the root resource. When enabled, get the client hostname through DNS reverse lookup for use in policy evaluation. This setting can impact performance. Time in seconds used adjust time difference between agent system and OpenAM. Clock skew in seconds = AgentTime - OpenAMServerTime. Use this property to adjust for small time differences encountered despite use of a time-synchronization service. When this property is not set and agent time is greater than OpenAM server time, the agent can make policy calls to the OpenAM server before the policy subject cache has expired, or you can see infinite redirection occur. Realm where OpenAM starts policy evaluation for this policy agent. Edit this property when OpenAM should start policy evaluation in a realm other than the top-level realm, /, when handling policy decision requests from this policy agent. This property is recognized by OpenAM, not the policy agent, and does not support realm aliases. Application where OpenAM looks for policies to evaluate for this policy agent. Edit this property when OpenAM should look for policies that belong to an application other than iPlanetAMWebAgentService when handling policy decision requests from this policy agent. This property is recognized by OpenAM, not the policy agent. This section covers miscellaneous web agent properties. After creating the agent profile, you access these properties in the OpenAM console under Realms > Realm Name > Agents > Web > Agent Name > Miscellaneous. As of version 3.0.4, when set to true, the agent sends composite advice in the query (GET request) instead of sending it through a POST request. The default locale for the agent. Enable or disable REMOTE_USER processing for anonymous users. When enabled, use URL encoding for special characters in cookies. This is useful when profile, session, and response attributes contain special characters, and the attributes fetch mode is set to HTTP_COOKIE. Sets cookie prefix in the attributes headers. Default: HTTP_. Maximum age in seconds of custom cookie headers. Default: 300. When enabled, enforces case insensitivity in both policy and not enforced URL evaluation. When enabled, encodes the URL which has special characters before doing policy evaluation. When enabled, do not send a preferred naming URL in the naming request. Use a Perl-compatible regular expression to filter out invalid request URLs. The policy agent rejects requests to invalid URLs with HTTP 403 Forbidden status without further processing. Use Advanced > Custom Properties to set this in the agent profile. For example, to filter out URLs containing the symbols in the list ./, /., /, ., ,\, %00-%1f, %7f-%ff, %25, %2B, %2C, %7E, .info, use the following setting. When enabled, do not check whether OpenAM is up before doing a 302 redirect. When enabled, strip path info from the request URL while doing the Not Enforced List check, and URL policy evaluation. This is designed to prevent a user from accessing a URI by appending the matching pattern in the policy or not enforced list. For example, if the not enforced list includes http://host/*.gif, then stripping path info from the request URI prevents access to http://host/index.html by using http://host/index.html?hack.gif. However, when a web server is configured as a reverse proxy for a J2EE application server, the path info is interpreted to map a resource on the proxy server rather than the application server. This prevents the not enforced list or the policy from being applied to the part of the URI below the application server path if a wildcard character is used. For example, if the not enforced list includes http://host/webapp/servcontext/* and the request URL is http://host/webapp/servcontext/example.jsp, the path info is /servcontext/example.jsp and the resulting request URL with path info stripped is http://host/webapp/, which does not match the not enforced list. Thus when this property is enabled, path info is not stripped from the request URL even if there is a wildcard in the not enforced list or policy. Make sure therefore when this property is enabled that there is nothing following the wildcard in the not enforced list or policy. When enabled, the agent encodes the LDAP header values in the default encoding of operating system locale. When disabled, the agent uses UTF-8. Property used only when CDSSO is enabled. Only change the default goto value when the login URL has a landing page specified, such as com.sun.identity.agents.config.cdsso.cdcservlet.url = http://openam.example.com:8080/openam/cdcservlet?goto= http://www.example.com/landing.jsp. The agent uses this parameter to append the original request URL to this cdcservlet URL. The landing page consumes this parameter to redirect to the original URL. As an example, if you set this value to goto2, then the complete URL sent for authentication is http://openam.example.com:8080/openam/cdcservlet?goto= http://www.example.com/landing.jsp?goto2=http://www.example.com/original.jsp. User ID of unauthenticated users. Default: anonymous. This section covers advanced web agent properties. After creating the agent profile, you access these properties in the OpenAM console under Realms > Realm Name > Agents > Web > Agent Name > Advanced. If the agent is behind a proxy or load balancer, then the agent can get client IP and host name values from the proxy or load balancer. For proxies and load balancer that support providing the client IP and host name in HTTP headers, you can use the following properties. When multiple proxies or load balancers sit in the request path, the header values can include a comma-separated list of values with the first value representing the client, as in client,next-proxy,first-proxy. HTTP header name that holds the IP address of the client. HTTP header name that holds the hostname of the client. Enable if a load balancer is used for OpenAM services. Enable if the agent is sitting behind a SSL/TLS off-loader, load balancer, or proxy such that the protocol users use is different from the protocol the agent uses. When enabled, the protocol is overridden with the value from the Agent Deployment URI Prefix (property: com.sun.identity.agents.config.agenturi.prefix). Enable if the agent is sitting behind a SSL/TLS off-loader, load balancer, or proxy such that the host name users use is different from the host name the agent uses. When enabled, the host is overridden with the value from the Agent Deployment URI Prefix (property: com.sun.identity.agents.config.agenturi.prefix). Enable if the agent is sitting behind a SSL/TLS off-loader, load balancer, or proxy such that the port users use is different from the port the agent uses. When enabled, the port is overridden with the value from the Agent Deployment URI Prefix (property: com.sun.identity.agents.config.agenturi.prefix). Enable if the agent is sitting behind a SSL/TLS off-loader, load balancer, or proxy such that the URL users use is different from the URL the agent uses. When enabled, the URL is overridden with the value from the Agent Deployment URI Prefix (property: com.sun.identity.agents.config.agenturi.prefix). Specifies whether to create a cookie, or to append a query string to the URL to assist with sticky load balancing. Specifies the key-value pair for stickysession mode. For example, a setting of lb=myserver either sets an lb cookie with myserver value, or adds lb=myserver to the URL query string. Enables HTTP POST data preservation. This feature is available in the Apache 2.2, Microsoft IIS 6, Microsoft IIS 7, and Sun Java System Web Server web policy agents as of version 3.0.3. POST cache entry lifetime in minutes. Default: 10. When HTTP POST data preservation is enabled, override properties are set to true, and the agent is behind a load balancer, then this property sets the name and value of the sticky cookie to use. The directory on the agent server where preserved post data will be written whilst authorization is requested from OpenAM. If you run multiple web servers with policy agents behind a load balancer that directs traffic based on the request URI, and you need to preserve POST data, then set this property. By default, policy agents use a dummy URL for POST data preservation, http://agent.host:port/dummypost/sunpostpreserve, to handle POST data across redirects to and from OpenAM. When you set this property, the policy agent prefixes the property value to the dummy URL path. In other words, when you set com.forgerock.agents.config.pdpuri.prefix = app1, the policy agent uses the dummy URL, http://agent.host:port/app1/dummypost/sunpostpreserve. Next, use the prefix you set when you define load balancer URI rules. This ensures that clients end up being redirected to the policy agent that preserved the POST data. When enabled ignore the host and port settings. The agent should normally perform authentication, so this is not required. If necessary, set to none. DES key for decrypting the basic authentication password in the session. The loading priority of filter, DEFAULT, HIGH, LOW, or MEDIUM. Enable if the IIS agent filter is configured for OWA. Enable to avoid IE6 security pop-ups. Set to true if encrypted password should be set in HTTP header AUTH_PASSWORD. Set to true if agent should do Windows Logon and User Impersonation. When enabled, the agent checks whether the user exists in the Domino name database. Enable if the agent needs to use LTPA Token. The name of the cookie that contains the LTPA token. The configuration name that the agent uses in order to employ the LTPA token mechanism. The organization name to which the LTPA token belongs. Additional properties to augment the set of properties supported by agentd. Such properties take the following forms. This section covers custom web agent properties. These settings do not appear as configurable options in the OpenAM Console, so must be added as custom properties, or set in the local configuration file. If using a centralized configuration, you create these properties in the OpenAM console under Realms > Realm Name > Agents > Web > Agent Name > Advanced > Custom Properties. These properties are only used within the local configuration file. They are not available in the OpenAM admin console. The agent uses these bootstrap properties to connect to OpenAM. The OpenAM realm where the agent profile is located. The name of the agent profile in OpenAM. The password required by the agent profile, encrypted with the key specified in com.sun.identity.agents.config.key. The encryption key used to encrypt the agent profile password, which should be provided in com.sun.identity.agents.config.password. Set this property to a list of protocols to support. The list consists of one or more protocol strings separated by colons. For example TLSv1.2:TLSv1.1:TLSv1. Set this to the number of seconds to keep the socket connection open before timing out. Applies to both TCP connect and receive operations. To disable timeouts, set this value to 0. Set this property to the file name that contains one or more CA certificates. The file should be Privacy Enhanced Mail (PEM) encoded. OpenAM requires PEM files to be base64-encoded ASCII data. You must set this property if com.sun.identity.agents.config.trust.server.certs is set to false. When OpenAM is configured to perform client authentication, set this property to the name of the file that contains the public PEM-encoded client certificate that corresponds with the private key specified in com.forgerock.agents.config.cert.key. Set this property to the name of the file that contains the private key. On UNIX systems, that key should be encoded in PEM format. On Windows systems, that entry depends. If SSL mutual authentication is required with OpenAM, that entry should contain the name of the private key or certificate imported in the Windows Certificate Manager, part of the Microsoft Management Console. For a web server, that should point to the Local Machine or Service certificate store, depending on the account associated with the Web server. $ ./agentadmin --p "key" "password"
Here, agent-type corresponds to the file system directory for the particular agent type, such as apache24_agent, password is the private key password, and key is the obfuscation key as specified by com.sun.identity.agents.config.key. You can generate a new obfuscation key by using agentadmin --k.
This property is not used on Microsoft Windows systems. Set this property to a list of ciphers to support. The list consists of one or more cipher strings separated by colons, as defined in the man page for ciphers available at http://www.openssl.org/docs/apps/ciphers.html. When SSL is configured, set to false to trust the OpenAM SSL certificate only if the certificate is found to be correct and valid. Default is true to make it easy to try SSL during evaluation. Notice that the default setting, true, means that the web policy agent trusts all server certificates. Change this to false, and test that your web policy agent can trust server certificates before deploying the policy agent in production. This property takes a comma-separated list of indexes for URL values indicating the order in which to fail over, where the indexes are taken from the values set for com.sun.identity.agents.config.naming.url, com.sun.identity.agents.config.login.url, com.sun.identity.agents.config.cdsso.cdcservlet.url, and com.sun.identity.agents.config.logout.url. Then the following setting means first use OpenAM on zero.example.com, then fail over if necessary to OpenAM on one.example.com, assuming com.forgerock.agents.ext.url.validation.level is set to enable validation. When using this failover capability make sure you synchronize URL settings in com.sun.identity.agents.config.naming.url, com.sun.identity.agents.config.login.url, com.sun.identity.agents.config.cdsso.cdcservlet.url, and com.sun.identity.agents.config.logout.url such that each service shares the same index across all properties. In other words, in the example above each service under http://zero.example.com:8080/openam would be the first item (index: 0) for each property. This ensures the policy agent fails over and fails back from one server to another in synchronized fashion for all services. This bootstrap configuration property lets you configure naming URL validation during the initial bootstrap phase when the policy agent reads its configuration, and then thereafter if the policy agent is configured fail over when a naming URL becomes invalid. When URL validation is fully disabled the policy agent does not need to connect to OpenAM during the bootstrap phase. If you leave naming URL validation disabled, then make sure that the URLs in the policy agent bootstrap configuration file are valid and correct. As the policy agent performs no further validation after the bootstrap phase, incorrect naming URLs can cause the agent to crash. When naming URL validation is enabled you should also ensure the com.sun.identity.agents.config.connect.timeout property is set to a reasonable value, such as 4 seconds, which is the default. This property can take the following values. Fully validate naming URLs specified by using the com.sun.identity.agents.config.naming.url property. The web policy agent logs into and logs out of OpenAM to check that a naming URL is valid. Check that naming URLs are valid by performing an HTTP GET, which should receive an HTTP 200 response. Disable all naming URL validation. Set this to the seconds between validation requests against the current naming URL. The value of the com.sun.identity.agents.config.connect.timeout property must not exceed this value. If validation requests against the current naming URL fail this number of times in a row, the web policy agent fails over to the next service in com.forgerock.agents.ext.url.validation.default.url.set. After failover, if validation requests against the default naming URL succeed this number of times in a row, the web policy agent fails back to that service, the first URL in the com.forgerock.agents.ext.url.validation.default.url.set list. Set this to the naming service URL(s) used for naming lookups in OpenAM. Separate multiple URLs with single space characters. Set this property to true to enable use of Cache-Control headers that prevent proxies from caching resources accessed by unauthenticated users. Default: false. Use regular expressions to specify a list of resource URLs that should trigger JSON-formatted errors to be returned rather than HTTP error codes. The web policy agents by default use a single connection and specify Connection:Keep-alive when logging in to OpenAM and fetching attributes or policy decisions. If a load-balancer or reverse-proxy is being used it may be necessary to disable the use of keep-alive, in which case set this property to true. This section covers web agent properties that are configured by using environment variables. You must restart the container in which web policy agents are running to apply changes to these settings. Configure the maximum amount of shared memory, in bytes, that the web policy agents use for caching. The maximum size the cache can grow to is approximately 2 gigabytes (exactly 0x7FFFF000 bytes). You can reduce the maximum size by setting AM_MAX_SHARED_POOL_SIZE, specified in bytes. You should not reduce the cache size to less than 10 megabytes. You cannot increase the default maximum cache size. Reducing the size of the cache may affect web policy agent performance under heavy workloads, such as handling thousands of concurrent sessions. This chapter addresses the question of configuring policy agents on protected servers that operate behind network load balancers. 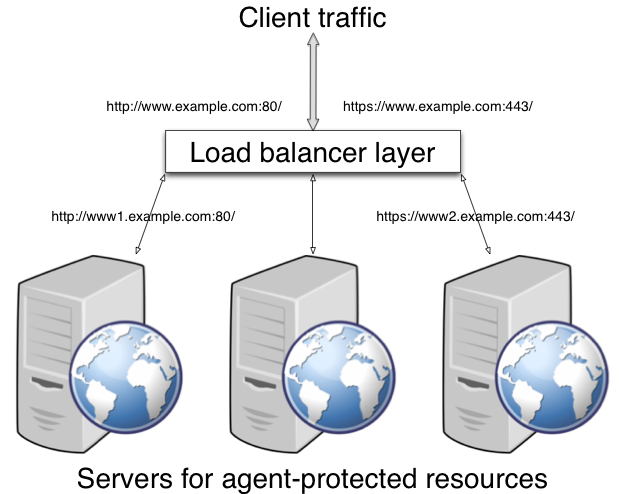 A load balancing layer that stands between clients and protected servers can distribute the client load, and fail client traffic over when a protected server goes offline. In the simplest case, the load balancing layer passes requests from the clients to servers and responses from servers to clients, managing the traffic so the client experience is as smooth as possible. If your deployment has protocols and port numbers on the load balancer that match those of the protected servers, see Section 3.7.2, "When Protocols and Port Number Match". A load balancing layer can also offload processor-intensive public-key encryption algorithms involved in SSL transactions to a hardware accelerator, reducing the load on the protected servers. The client connects to the load balancer over HTTPS, but the load balancer connects to the servers over HTTP. If your deployment uses SSL offloading, see Section 3.7.3, "When Protocols and Port Number Differ". When the protocol on the load balancer, such as HTTP or HTTPS, matches the protocol on the protected web server, and the port number the load balancer listens on, such as 80 or 443, matches the port number the protected web server listens on, then the main difference between URLs is in the host names. Map the agent host name to the host name for the load balancer. When protocols and port numbers match, configure fully qualified domain name (FQDN) mapping. Login to OpenAM Console as an administrative user with rights to modify the policy agent profile. Browse to Realms > Realm Name > Agents > Web > Agent Name to open the web agent profile for editing. In the Global tab page section Fully Qualified Domain Name Checking, make sure FQDN checking is selected (the default). The equivalent property setting is com.sun.identity.agents.config.fqdn.check.enable=true. Set FQDN Default to the fully qualified domain name of the load balancer, such as lb.example.com, rather than the protected server FQDN where the policy agent is installed. The equivalent property setting is com.sun.identity.agents.config.fqdn.default=lb.example.com. Set FQDN Virtual Host Map to map the protected server FQDN to the load balancer FQDN, for example, where the key agent.example.com (protected server) has value lb.example.com (load balancer). The equivalent property setting is com.sun.identity.agents.config.fqdn.mapping[agent.example.com]=lb.example.com. Save your work, and then restart the protected server. When the load balancer protocol and port, such as HTTPS and 443, differ from the protocol on the protected web server, such as HTTP and 80, then you must override these in the policy agent configuration. Use the Agent Deployment URI Prefix setting to override the agent protocol, host, and port with that of the load balancer. The web policy agent configuration for SSL offloading has the side effect of preventing FQDN checking and mapping. As a result, URL rewriting and redirection does not work correctly when the policy agent is accessed directly and not through the load balancer. This should not be a problem for client traffic, but potentially could be an issue for applications accessing the protected server directly, from behind the load balancer. In the Global tab page Profile section, set the Agent Deployment URI Prefix to that of the load balancer. The value you set here is used when overriding protocol, host, and port on the protected server with the web policy agent. The property to set is com.sun.identity.agents.config.agenturi.prefix. In the Advanced tab page Load Balancer section, enable Load Balancer Setup. The equivalent property setting is com.sun.identity.agents.config.load.balancer.enable=true. Enable Override Request URL Protocol. The equivalent property setting is com.sun.identity.agents.config.override.protocol=true. Enable Override Request URL Host. The equivalent property setting is com.sun.identity.agents.config.override.host=true. Enable Override Request URL Port. The equivalent property setting is com.sun.identity.agents.config.override.port=true. Enable Notification URL when the web policy agent gets notifications about configuration changes. The equivalent property setting is com.sun.identity.agents.config.override.notification.url=true. An agent authenticator has read-only access to multiple agent profiles defined in the same realm, typically allowing an agent to read web service agent profiles. After creating the agent profile, you access agent properties in the OpenAM console under Realms > Realm Name > Agents > Agent Authenticator > Agent Name. Specifies the password the agent uses to connect to OpenAM. Specifies whether the agent profile is active, and so can be used. Specifies which agent profiles in the realm the agent authenticator can read. Specifies the list of agent root URLs for CDSSO. The valid value is in the format protocol://hostname:port/ where protocol represents the protocol used, such as http or https, hostname represents the host name of the system where the agent resides, and port represents the port number on which the agent is installed. The slash following the port number is required. If your agent system also has virtual host names, add URLs with the virtual host names to this list as well. OpenAM checks that goto URLs match one of the agent root URLs for CDSSO. The configuration file syntax is that of a standard Java properties file. See java.util.Properties.load for a description of the format. The value of a property specified multiple times is not defined. This chapter covers prerequisites and installation procedures for Web Policy Agents 4 into Apache HTTP Servers 2.2.x and 2.4.x. This section describes the prerequisite steps you should take before installing the web policy agents into Apache HTTP servers. Avoid installing the web server and the web policy agent as root. Instead, create a web server user and install as that user. If you cannot avoid installing the web server and web policy agent as root, then you must give all users read and write permissions to the logs and logs/debug directories under the agent instance directory (/web_agents/type/Agent_nnn/logs/). Otherwise, the web policy agent fails with an error when attempting to rotate log files. The SELinux OS feature can prevent the agents from being able to write to audit and debug logs. See Chapter 6, "Troubleshooting". Ensure OpenAM is installed and running, so that you can contact OpenAM from the system running the policy agent. Create a profile for your policy agent as described in Chapter 3, "Configuring Web Policy Agents". Create at least one policy in OpenAM to protect resources with the agent, as described in the section on Configuring Policies. Consider creating a simple policy, such as a policy that allows only authenticated users to access your resources. This allows you to test your policy agent after installation. If the OpenAM server uses SSL, you must install OpenSSL on the agent machine. On UNIX systems, ensure the OpenSSL libraries libcrypto.so and libssl.so are available in the path specified by either the LD_LIBRARY_PATH or LD_LIBRARY_PATH_64 environment variables. On Windows systems, ensure the OpenSSL libraries libeay32.dll and ssleay32.dll are available in the lib folder of your agent installation, for example c:\path\to\web_agents\iis_agent\lib\. For information about supported OpenSSL libraries, see Table 2.2, "Supported OpenSSL Versions" in the OpenAM Web Policy Agent Release Notes. Install Apache HTTP Server before you install the policy agent. You must stop the server during installation. See the OpenAM Installation Guide section, Obtaining OpenAM Software to determine which version of the agent to download, and download the agent. Also, verify the checksum of the file you download against the checksum posted on the download page. Unzip the file in the directory where you plan to install the web policy agent. The agent stores its configuration and logs under this directory. The installation and configuration program agentadmin. Configuration templates used by the agentadmin command during installation. Configuration files, and audit and debug logs for individual instances of the web policy agents will be created here. The folder is empty when first extracted. Contains licensing information including third-party licenses. Shared libraries used by the policy agent. Location for log files written during installation. The folder is empty when first extracted. Apache 2.0 and later comes with Multi-Processing Modules (MPMs) that extend the basic functionality of a web server to support the wide variety of operating systems and customizations for a particular site. The key area of performance tuning for Apache is to run in worker mode ensuring that there are enough processes and threads available to service the expected number of client requests. Apache performance is configured in the conf/extra/http-mpm.conf file. The key properties in this file are ThreadsPerChild and MaxClients. Together the properties control the maximum number of concurrent requests that can be processed by Apache. The default configuration allows for 150 concurrent clients spread across 6 processes of 25 threads each. For the policy agent notification feature, the MaxSpareThreads, ThreadLimit and ThreadsPerChild default values must not be altered; otherwise the notification queue listener thread cannot be registered. Any other values apart from these three in the worker MPM can be customized. For example, it is possible to use a combination of MaxClients and ServerLimit to achieve a high level of concurrent clients. Complete the following procedures to install Web Policy Agents 4 into Apache HTTP Servers. Check that you have completed any prerequisite steps before proceeding. See Section 4.1, "Before You Install". Available in 32-bit and 64-bit. By default, extracts to a folder named ./web_agents/apache22_agent/. Available in 32-bit and 64-bit. By default, extracts to a folder named ./web_agents/apache24_agent/. The following procedures show how to install into Apache 2.4. If installing into Apache 2.2, alter the path names accordingly. Regardless of whether you store configurations centrally in OpenAM or locally with your agents, the agent requires a profile so that it can connect to and communicate with OpenAM. In the OpenAM console, browse to Realms > Realm Name > Agents > Web, and then click the New... button in the Agent table. Complete the web form using the following hints. Centralized configurations are stored in the OpenAM configuration store. You can manage the centralized configuration through the OpenAM console. Local configurations are stored in a file alongside the agent. In centralized configuration mode, the Server URL is used to populate the agent profile for services, such as Login, Logout, Naming, and Cross Domain SSO. In centralized configuration mode, the Agent URL is used to populate the Agent Profile for services, such as notifications. Create a text file containing only the password specified when creating the agent profile. In Windows Explorer, right-click the created password file, for example pwd.txt, select Read-Only, and then click OK. Shut down the Apache server where you plan to install the agent. Run agentadmin --i to install the agent. You will be prompted to read and accept the software license agreement for the agent installation. When prompted for information, enter the inputs appropriate for your deployment. Enter the full path to the Apache HTTP Server configuration file. The installer modifies this file to include the web policy agent configuration and module. Server to store its configuration. The installer can change the directory ownership to the same User and Group specified in the Apache configuration. Enter yes to alter directory ownership, press Enter to accept the default: no. The installer can import settings from an existing web policy agent into the new installation and skips prompts for any values present in the existing configuration file. You will be required to re-enter the agent profile password. Enter the full path to an existing agent configuration file to import the settings, or press Enter to skip the import. Enter the full URL of the OpenAM instance the web policy agents will be using. Ensure that the deployment URI is specified. Enter the full URL of the server the agent is running on. Enter the name given to the agent profile created in OpenAM. Enter the OpenAM realm containing the agent profile. Enter the full path to the file containing the agent profile password created earlier. The installer displays a summary of the configuration settings you specified. If a setting is incorrect, type no, or press Enter. The installer loops through the configuration prompts again, using your provided settings as the default. Press Enter to accept each one, or enter a replacement setting. If the settings are correct, type yes to proceed with installation. Upon successful completion, the installer adds the agent as a module to the Apache HTTP Server configuration file. You can find a backup configuration file in the Apache HTTP Server configuration directory, called http.conf_amagent_date_and_time_of_installation. The installer also sets up configuration and log directories for the agent instance. Each agent instance that you install on the system has its own numbered configuration and logs directory. The first agent's configuration and logs are located under the directory web_agents/apache24_agent/instances/agent_1/. Contains the bootstrap properties the web policy agent requires to connect to OpenAM and download its configuration. Also contains properties that are only used if you configure the web policy agent to use local configuration. Operational audit log directory, only used if remote logging to OpenAM is disabled. Debug directory where the amAgent debug file resides. Useful in troubleshooting policy agent issues. Start the Apache server in which you installed the web policy agent. (Optional) If you have a policy configured, you can test your policy agent. For example, try to browse to a resource that your policy agent protects. You should be redirected to OpenAM to authenticate, for example, as user demo, password changeit. After you authenticate, OpenAM redirects you back to the resource you tried to access. Complete the following procedures to install Web Policy Agents 4 into Apache HTTP Server virtual hosts. Installing into an Apache virtual host is a manual process, which involves copying an instance directory created by the agentadmin installer and adding to the Apache configuration file of the virtual host. Check that you have completed the prerequisite steps before proceeding. See Section 4.1, "Before You Install". You will also need to have installed a web policy agent into the default root Apache configuration file before installing into a virtual host. See Section 4.2, "Installing Apache Web Policy Agents". This procedure assumes you have installed a web policy agent into the default root configuration of your Apache HTTP Server installation, with configuration in /web_agents/apache24_agent/instances/agent_1. To install into a virtual host, copy this configuration folder, modify required settings, and enable the web policy agent in the virtual host configuration file. Alter the value of com.sun.identity.agents.config.username to be the name of the agent profile you created in OpenAM for the virtual host. (Optional) If you used a different password when creating the new agent profile in OpenAM, you will need to configure the encryption key and password value in the agent configuration file. Generate a new signing key, by running agentadmin --k.
$ ./agentadmin --p "YWM0OThlMTQtMzMxOS05Nw==" "newpassword"
com.sun.identity.agents.config.key to be the generated encryption key value. com.sun.identity.agents.config.password to be the generated encrypted password value. Replace any references to the original instance directory with the new instance directory. For example, replace the string agent_1 with agent_2 wherever it occurs in the configuration file. Replace any references to the original website being protected with the new website being protected. For example, replace http://www.example.com:80/amagent with http://customers.example.com:80/amagent. Edit the Apache HTTP Server configuration file. This is the same file specified when installing the web policy agent into the default Apache website. For example, /etc/httpd/conf/httpd.conf. If the new virtual host configuration is in a separate file, copy the two configuration lines into the VirtualHost element within that file. Save and close the Apache HTTP Server configuration file. Start the Apache HTTP server in which you installed the web policy agent. You can run a silent, non-interactive installation by running agentadmin --s, along with arguments used to configure the instance. Enter the full URL of the OpenAM instance the web policy agents will be using. Ensure the deployment URI is specified. Enter the full path to the file containing the agent profile password. To have the installer change the ownership of created directories to be the same User and Group as specified in the Apache configuration, specify the optional --changeOwner switch. You can suppress the license agreement prompt during a silent, non-interactive install by including the --acceptLicence parameter. The inclusion of the option indicates that you have read and accepted the terms stated in the license. To view the license agreement, open /path/to/web_agents/agent_type/legal/Forgerock_License.txt. Optionally have the installer proceed with a silent installation even if it cannot connect to the specified OpenAM server during installation, rather than exiting. Shut down the Apache server where the agent is installed. Run agentadmin --l to output a list of the installed web policy agent configuration instances. Make a note of the ID value of the configuration instance you want to remove. Run agentadmin --r, and specify the ID of the web policy agent configuration instance to remove. A warning is displayed. Type yes to proceed with removing the configuration instance. multi-virtualhost mode, an uninstallation must be carried out manually. This chapter covers prerequisites and installation procedures for Web Policy Agents 4 into Microsoft Internet Information Services (IIS) 7 and 8. This section describes the prerequisite steps you should take before installing the web policy agents into IIS servers. Create a profile for your policy agent as described in Configuring Web Policy Agent Profiles. If the OpenAM server you will be connecting to uses SSL, you must install OpenSSL on the agent machine. Ensure the OpenSSL libraries libeay32.dll and ssleay32.dll are available in the lib folder of your agent installation, for example c:\path\to\web_agents\iis_agent\lib\. Web policy agents require that the Application Development component is installed alongside the core IIS services. Application Development is an optional component of the IIS web server. The component provides required infrastructure for hosting web applications. Unzip the file in the directory where you plan to install the web policy agent. The agent you install stores its configuration and logs under this directory. Check that you have completed the prerequisite steps before proceeding. See Section 5.1, "Before You Install". Log on to Windows as a user with administrator privileges. Run agentadmin.exe with the --i switch to install the agent. You will be prompted to read and accept the software license agreement for the agent installation. Enter the ID number of the IIS site in which to install the web policy agent. id: 1   name: "DEFAULT WEB SITE"
Enter IIS Server Site identification number. Enter the full URL of the site the agent will be running in. If a setting is incorrect, type no, or press Enter. The installer loops through the configuration prompts using your provided settings as the default. Press Enter to accept each one, or enter a replacement setting. Upon successful completion, the installer adds the agent as a module to the IIS site configuration. The installer also sets up configuration and log directories for the agent instance. Each agent instance that you install on the system has its own numbered configuration and logs directory. The first agent's configuration and logs are located under the directory web_agents\iis_agent\instances\agent_1\. The installer grants full access permissions on the created instance folder to the user that the selected IIS site is running under, so that log files can be written correctly. You can run a silent, non-interactive installation by running agentadmin.exe --s, along with arguments used to configure the instance. Enter the full URL of the IIS site the agent will be running on. Optionally have the installer change the ownership of created directories to be the same user that is running the selected IIS site. Add this optional switch to have the installer proceed with a silent installation even if it cannot connect to the specified OpenAM server during installation, rather than exiting. 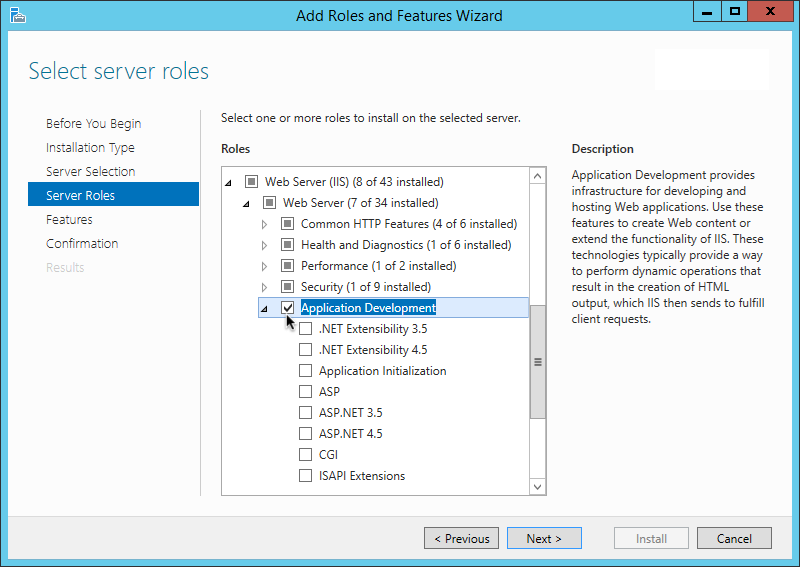 OpenAM Web Agent for IIS Server installation. This section explains how to disable, enable, and remove web policy agents that are in an IIS site, and how to completely uninstall web policy agents from IIS. Run agentadmin.exe --l to output a list of the installed web policy agent configuration instances. Make a note of the ID value of the configuration instance you want to disable or enable. To disable the web policy agent in a site, run agentadmin.exe --d, and specify the ID of the web policy agent configuration instance to disable. To enable the web policy agent in a site, run agentadmin.exe --e, and specify the ID of the web policy agent configuration instance to enable. Run agentadmin.exe --r, and specify the ID of the web policy agent configuration instance to remove. Run agentadmin --g. A warning is displayed. Type yes to proceed with removing the configuration instance. Removing agent module from IIS Server configuration... Done. The IIS web policy agent now supports IIS basic authentication and password replay. You must use the appropriate software versions. Given the proper configuration and with Active Directory as a user data store for OpenAM, the IIS web policy agent can provide access to the IIS server variables. The instructions for configuring the capability follow in this section, though you should read the section in full, also paying attention to the required workarounds for Microsoft issues. When configured as described, the policy agent requests IIS server variable values from OpenAM, which gets them from Active Directory. The policy agent then sets the values in HTTP headers so that they can be accessed by your application. The following IIS server variables all take the same value when set: REMOTE_USER, AUTH_USER, and LOGON_USER. The policy agent either sets all three, or does not set any of them. When you enable Logon and Impersonation in the console (com.sun.identity.agents.config.iis.logonuser=true in the policy agent configuration), the policy agent performs Windows logon and sets the user impersonation token in the IIS session context. When you enable Show Password in HTTP Header in the console (com.sun.identity.agents.config.iis.password.header=true in the policy agent configuration), the policy agent adds it in the USER_PASSWORD header. The policy agent does not modify any other IIS server variables related to the authenticated user's session. For Microsoft Office integration, you must use Microsoft Office 2007 SP2 or later. For Microsoft SharePoint integration, you must use Microsoft SharePoint Server 2007 SP2 or later. You must also apply workarounds as described for the following Microsoft issues. Description: Error message when you try to connect to a Windows SharePoint document library: "System error 5 has occurred". Summary: Enable Basic Authentication on the client computer. Description: Office 2003 and 2007 Office documents open read-only in Internet Explorer. Summary: Add registry keys as described in Microsoft's support document. Description: Error message when you open a Web site by using Basic authentication in Expression Web on a computer that is running Windows Vista: "The folder name is not valid". Summary: Edit the registry as described in Microsoft's support document. Description: Persistent cookies are not shared between Internet Explorer and Office applications. Summary: Add the web site the list of trusted sites. Description: Prompt for Credentials When Accessing FQDN Sites From a Windows Vista or Windows 7 Computer. Description: SharePoint Server 2007 Cumulative Update Server Hotfix Package (MOSS server-package): April 30, 2009. Summary: Apply the fix from Microsoft if you use SharePoint. Description: You cannot open Office file types directly from a server that supports only Basic authentication over a non-SSL connection. Summary: Enable SSL encryption on the web server. In the OpenAM console navigate to Realms > Realm Name > Agents > Web > Agent Name > Advanced > Microsoft IIS Server > Replay Password Key (property name: com.sun.identity.agents.config.replaypasswd.key), enter the generated key, and then click Save. In the OpenAM console, navigate to Configuration > Servers and Sites > Server Name > Advanced > Add..., then add a property com.sun.am.replaypasswd.key with the key you generated as the value, and then click Save. In the OpenAM console, navigate to Realms > Realm Name > Authentication > Settings > Post Authentication Processing > Authentication Post Processing Classes, then add the class com.sun.identity.authentication.spi.ReplayPasswd, and then click Save. If you require Windows logon, or you need to use basic authentication with SharePoint or OWA, then you must configure Active Directory as a user data store, and you must configure the IIS policy agent profile User ID Parameter and User ID Parameter Type so that the policy agent requests OpenAM to provide the appropriate account information from Active Directory in its policy response. Skip this step if you do not use SharePoint or OWA and no Windows logon is required. Make sure OpenAM data store is configured to use Active Directory as the user data store. In the OpenAM console under Realms > Realm Name > Agents > Web > Agent Name > OpenAM Services > Policy Client Service, set User ID Parameter and User ID Parameter Type, and then save your work. For example if the real username for Windows domain logon in Active Directory is stored on the sAMAccountName attribute, then set the User ID Parameter to sAMAccountName, and the User ID Parameter Type to LDAP. Setting the User ID Parameter Type to LDAP causes the policy agent to request that OpenAM get the value of the User ID Parameter attribute from the data store, in this case, Active Directory. Given that information, the policy agent can set the HTTP headers REMOTE_USER, AUTH_USER, or LOGON_USER and USER_PASSWORD with Active Directory attribute values suitable for Windows logon, setting the remote user, and so forth. To set the encrypted password in the AUTH_PASSWORD header, browse in the OpenAM console to Realms > Realm Name > Agents > Web > Agent Name > Advanced > Microsoft IIS Server, then select Show Password in HTTP Header, and then click Save. To have the agent perform Windows logon (for user token impersonation), browse in the OpenAM console to Realms > Realm Name > Agents > Web > Agent Name > Advanced > Microsoft IIS Server, then select Logon and Impersonation, and then click Save. In the OpenAM console, navigate to Realms > Realm Name > Agents > Web > Agent Name > Advanced > Microsoft IIS Server, then set Authentication Type to basic, and then click Save. (Optional) To access Microsoft Office from SharePoint pages, configure OpenAM to persist the authentication cookie. For details, see "Hints for the Persistent Cookie Module" in the OpenAM Administration Guide. This chapter offers solutions to issues during installation of OpenAM policy agents. If OpenSSL is correctly installed and you are using a Windows 7 or Windows Server 2008 R2 system, apply the update provided in Microsoft knowledge base article KB2533623. See Microsoft Security Advisory: Insecure library loading could allow remote code execution. I am trying to install the policy agent on SELinux and I am getting error messages after installation. What happened? SELinux must be properly configured to connect the web policy agent and OpenAM nodes. Either re-configure SELinux or disable it, then reinstall the policy agent. My Apache HTTP server is not using port 80. But when I install the web policy agent it defaults to port 80. How do I fix this? You probably set ServerName in the Apache HTTP Server configuration to the host name, but did not specify the port number. First, avoid installing the web server (and therefore also the web policy agent) as root, but instead create a web server user and install as that user. If however you cannot avoid installing the web server and policy agent as root, the you must give all users read and write permissions to the logs/ directory under the agent instance directory (/web_agents/agent_version/instances/agent_nnn/logs/). Otherwise, the web policy agent fails to rotate log files with the error you observed. How do I increase security against possible phishing attacks through open redirect? You can specify a list of valid URL resources against which OpenAM validates the goto and gotoOnFail URL using the Valid goto URL Resource service. OpenAM only redirects a user if the goto and gotoOnFail URL matches any of the resources specified in this setting. If no setting is present, it is assumed that the goto and gotoOnFail URL is valid. To set the Valid goto URL Resources, use the OpenAM console, and navigate to Realms > Realm Name > Services. Click Add, select Validation Service, and then add one or more valid goto URLs. You can use the "*" wildcard to define resources, where "*" matches all characters except "?". For example, you can use the wildcards, such as https://website.example.com/* or https://website.example.com/*?*. For more specific patterns, use resource names with wildcards as described in the procedure, Configuring Valid goto URL Resources. This command manages OpenAM policy agent installations. Perform an interactive install of a new agent instance. Section 4.2, "Installing Apache Web Policy Agents"
Section 5.2, "Installing IIS Web Policy Agents"
Perform a silent, non-interactive install of a new agent instance. When installing in Apache HTTP Server, enter the full path to the Apache HTTP server configuration file. The installer modifies this file to include the web policy agent configuration and module. When installing in Microsoft IIS, enter the ID number of the IIS site in which to install the web policy agent. To list the available sites in an IIS server and the relevant ID numbers, run agentadmin.exe --n.
Enter the full URL of the OpenAM instance that the web policy agents will use. Ensure the deployment URI is specified. Enter the full URL of the server on which the agent is running. Enter the name of the agent profile in OpenAM. Enter the full path to the agent profile password file. Use this option to change the ownership of the created directories to be the same user and group as specified in the Apache HTTP Server configuration, or the user that is running the selected IIS site. When you run certain commands, you will be prompted to read and accept the software license agreement. You can suppress the license agreement prompt by including the optional --acceptLicence parameter. Specifying this options indicates that you have read and accepted the terms stated in the license. To view the license agreement, open /path/to/web_agents/agent_type/legal/Forgerock_License.txt. Add this option to proceed with a silent installation even if it cannot connect to the specified OpenAM server during installation, rather than exiting. Section 4.4, "Installing Apache Web Policy Agents Silently"
Section 5.3, "Installing IIS Web Policy Agents Silently"
List the sites available in an IIS server. List existing configured agent instances. Remove an existing agent instance. The ID of the web policy agent configuration instance to remove. Respond yes when prompted to confirm removal. Section 4.5, "Removing Apache Web Policy Agents"
Section 5.4, "Managing IIS Web Policy Agents"
Generate a new signing key. For more information, see Encryption Properties. Use a generated encryption key to encrypt a new password. An encryption key, generated by the agentadmin --k command. C:\web_agents\apache24_agent\bin> agentadmin --p "YWM0OThlMTQtMzMxOS05Nw==" "newpassword"
Display agentadmin build and version information. OpenIG, OpenIG or Policy Agent?